Phentermine.com focuses on providing information and support for people taking the prescription weight loss drug phentermine. However, there are a variety of other options that you and your doctor can consider when discussing potential medications for weight loss. Here we’ll explore some other prescription weight loss drugs on the market and how they compare to phentermine. If you just want the summary, check out this quick infographic! If you’d prefer the long version, keep reading. Do all prescription weight loss drugs work the same? No. All weight loss medications are intended to help you shed some extra pounds, but each drug has a slightly different mechanism of action. For example, phentermine is a central nervous system stimulant that blunts appetite and boosts metabolism by simulating a “fight or flight” response. On the other hand, Belviq works by activating serotonin receptors to promote a quicker feeling of fullness and Xenical slows fat absorption in the gut. While each weight loss drug affects our brain and body differently, they are all designed to help you reach your weight loss goals a little more easily. Nonetheless, all weight loss medications work best when used in tandem with a healthy, calorie-restricted diet and regular physical activity. Belviq, approved by the FDA in 2012, is a popular prescription weight loss drug that helps you eat less by making you feel fuller faster. It is produced by Arena Pharmaceuticals GmbH, who also make BelviqXR®. Unlike phentermine, the active ingredient in Belviq is lorcaserin HCl. This differs from phentermine or Adipex, which contain phentermine HCl as the active ingredient. Lorcaserin works by activating serotonin receptors to more quickly recognize the circulating molecules. Serotonin is a neurotransmitter commonly associated with happiness, but it also helps our brains signal satiety (fullness) to our bodies. So, Belviq works by helping your brain more readily detect free serotonin and signal your body to stop eating. In that way, the medication helps you eat less and lose more weight. The dosage of Belviq is also different than that of phentermine. The suggested dose is 10mg of Belviq twice a day, or one 20mg BelviqXR (extended-release) tablet once a day. Phentermine dosage ranges from 8mg to 37.5mg and is taken one to three times per day. Like phentermine, Belviq is for people with a BMI over 27 who have a serious weight-related condition, or those with a BMI greater than 30. You should not take this weight loss drug if you are pregnant/nursing, have diabetes, congestive heart failure, sickle cell anemia, kidney or liver problems, or if you are allergic any of the medication’s components. Also similar to phentermine, Belviq is classified as a controlled substance. It is not a narcotic or a stimulant, but it is only available with a doctor’s prescription. As with phentermine, Belviq comes with a long list of possible side effects. The common side effects are comparable, but Belviq’s serious side effects differ from those of phentermine. Adverse reactions to Belviq include serotonin syndrome, valvular heart disease, changes in attention/memory, depression, slow heartbeat, decreased blood cell count, painful erections, or increased prolactin (the breast milk-producing hormone). More common side effects are similar to those seen with phentermine and include headache, dizziness, fatigue, nausea, dry mouth, constipation, cough, low blood sugar in people with type 2 diabetes and back pain. To learn more about Belviq, visit Eisai Inc. and Arena Pharmaceuticals GmbH’s website here. If you are debating between Belviq vs. Qsymia, many people find that one or the other works much better for them. You’ll find information on both prescription weight loss drugs in this article. After reading, you can discuss the pros and cons of each medication with your prescribing doctor before making a final decision about Belviq vs. Qsymia. Contrave, approved by the FDA in 2014, is another common prescription weight loss drug that helps you eat less by reducing appetite and controlling cravings. It is a combination of naltrexone and bupropion extended-release. Naltrexone is typically used to manage alcohol or opioid addiction, while bupropion is an anti-depressant that is also used to ease smoking cessation. Contrave does not contain phentermine HCl. One main difference between these two prescription weight loss drugs is their mechanisms of action. Contrave works by targeting two separate parts of your brain – the hypothalamus and the mesolimbic pathway. The bupropion acts in the hypothalamus to reduce appetite, while the naltrexone affects the mesolimbic pathway (or reward pathway) to control cravings. These effects are distinct from phentermine’s stimulant action. Dosage of Contrave is also different from that of phentermine. With Contrave, you gradually increase dose for 12 weeks and take pills in both the morning and evening after the first week. Unlike phentermine, which is only approved for short-term use, Contrave can be (and is often) taken for more than three months. Contrave is not a controlled substance. Like phentermine, Contrave is designed for people with a BMI over 27 who have a serious weight-related condition, or those with a BMI greater than 30. You should not use Contrave if you are pregnant/nursing, have uncontrolled high blood pressure, an eating disorder, a history of seizures, take opioids, or have recently stopped using opioids, alcohol or seizure medication. Both prescription weight loss drugs also carry the risk of serious side effects, as well as sharing similar common side effects. Serious potential side effects of Contrave include suicidal or manic thoughts and actions, increased risk of epileptic seizures, higher risk of opioid overdose or sudden opioid withdrawal, severe allergic reaction, elevated heart rate or blood pressure, liver damage or hepatitis, eye problems and low blood sugar in patients with type 2 diabetes. Similar to phentermine, more common side effects are nausea/vomiting, constipation or diarrhea, headache, dizziness, insomnia and dry mouth. To read more about Contrave, visit Orexigen Therapeutics, Inc.’s website here. Saxenda, approved by the FDA in 2014, is the only medication on this list that comes in the form of an injection. Unlike other weight loss medications, Saxenda mimics the action of a naturally-occurring hormone (GLP-1) to suppress appetite. One major difference between these two prescription weight loss drugs is how you take them: Saxenda is an injection, while phentermine is a pill. When you are first prescribed Saxenda, your doctor will have to teach you how to inject the medication. Unlike phentermine, which is usually given as half or full dose from the start, the amount of medication prescribed via Saxenda’s once-daily injections gradually increases each week until you reach the full dose at week five. Another notable difference relates to the prescription weight loss drugs’ effect on the body. While phentermine acts as a stimulant, Saxenda imitates the action of a hormone called glucagon-like peptide, or GLP-1. The injected medicine acts on your hypothalamus to decrease appetite and slow glucose absorption from the digestive tract. Similar medications are used to treat diabetes. However, Saxenda is not approved to treat type 2 diabetes and should not be used with other GLP-1 agonists (like Victoza) or insulin. Unlike phentermine, Saxenda (liraglutide) is not a controlled substance. The injection was also approved by the FDA for longer term use. Like phentermine, Saxenda is indicated for people with a BMI over 27 who have a serious weight-related condition, or those with a BMI greater than 30. Due to the increased risk of thyroid tumors and cancer, you should not use Saxenda if you or any family member has ever had MTC or if you have MEN 2. Also avoid Saxenda if you are pregnant/nursing, allergic to any of the ingredients, have gastroparesis or any other serious problems with your stomach, pancreas, kidneys or liver, or have or had depression. Both prescription weight loss drugs also carry the risk of serious side effects, while sharing similar common side effects. Serious potential side effects of Saxenda include: thyroid tumors/cancer, acute pancreatitis, gallstones, hypoglycemia in people with type 2 diabetes, heart racing, kidney problems/failure, depression or thoughts of suicide, or serious allergic reaction. Similar to phentermine, more common side effects are nausea/vomiting, constipation or diarrhea, headache, dizziness, stomachache, tiredness and changes in lipase levels. The manufacturer reports that nausea is the most common reaction and typically decreases over time. Still, there is a Saxenda REMS in-place given the gravity of this medication’s possible side effects. To read more about Saxenda (or the Saxenda REMS), visit Novo Nordisk Inc.’s website here. Xenical, approved by the FDA in 1999, is the prescription-strength version of popular weight loss pill, Alli. Both pills contain the active ingredient orlistat. Unlike other prescription weight loss drugs, orlistat doesn’t affect appetite or metabolism. Instead, it impacts your gut to help you absorb fewer calories. The main difference between orlistat and phentermine is how the two medications help you achieve weight loss. Like we’ve said, phentermine affects the brain to suppress appetite and boost energy. Xenical, on the other hand, targets your intestines so that when you eat you absorb fewer calories. So, eating healthy portions is left to willpower, but orlistat can help your body absorb fewer calories. More specifically, this medication decreases fat absorption in the intestine. The medication’s effect does, however, motivate you to makeover your diet since eating too much fat while taking Xenical can cause some very unpleasant side effects (e.g. incontinence). Xenical’s dosage is also different than phentermine’s. Xenical is typically taken as 3 pills per day, one with each low-fat meal. It can be taken for a longer period of time since it is not addictive, but may cause fat-soluble vitamin deficiencies due to poor absorption. As a result, Xenical patients should take a multivitamin containing fat-soluble vitamins – especially beta-carotene and vitamin D – either at night or a few hours before taking orlistat. Finally, side effects differ significantly between Xenical and other prescription weight loss drugs. Possible serious side effects of Xenical (orlistat) include liver, kidney and pancreatic problems, or allergic reaction. More common side effects are oily spotting, flatus with discharge, oily stools, loose or urgent stools, more frequent bowel movements, stomach pain and nausea. Like phentermine, Xenical is for people with a BMI over 27 who have a serious weight-related condition, or those with a BMI greater than 30. You should not take Xenical if you have any disease that causes malabsorption, gallbladder problems, a past or present eating disorder, problems with your kidneys, liver or pancreas, hypothyroidism, or had an organ transplant (or take cyclosporine for any other reason). Like all prescription weight loss drugs, you should not take Xenical if you are pregnant, nursing or trying to become pregnant. Apart from the similarities in use, phentermine and orlistat are relatively distinct. The mechanism of action, dosage and side effects of Xenical are all very different from those of phentermine. To learn more about Xenical, visit Genetech’s website here. Qsymia contains phentermine, but it’s not just phentermine, so we’ll include it in this list of “others”. This popular medication combines phentermine with topiramate extended-release to create a potent weight loss medication. Topiramate (Topamax) is used alone as an anti-seizure or anti-migraine medication. However, doctors recently realized it is an effective complement to phentermine in patients looking to lose weight. While the phentermine suppresses appetite and boosts energy, topiramate increases satiety and makes food less appetizing. The two medications are now sold together in one pill called Qsymia. While there is no generic version of Qsymia, some doctors will prescribe the two pills separately at the same time, which can be cheaper. Qsymia can be taken for a longer period of time than phentermine alone, but can also cause serious side effects including vision problems, depression and – if taken while pregnant – serious birth defects. Still, may patients give this medication positive reviews and lose significant weight with the help of Qsymia. To learn more about this medication, visit our informational page about Qsymia! … And if I don’t have a prescription? These are all valid options if you’re seeing a doctor and looking for a prescription to help you reach your weight loss goals. But what if you or don’t want to (or can’t) take prescription weight loss drugs? 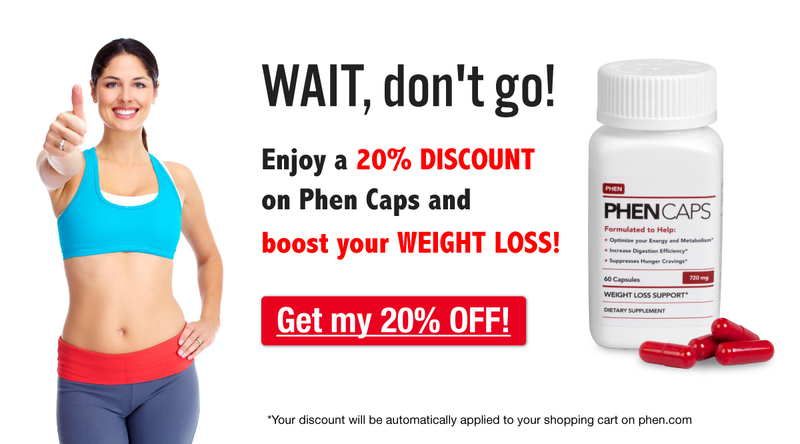 Phen Caps is a dietary supplement designed to help suppress appetite and boost energy, without all the negative side effects. It contains all-natural ingredients and no phentermine HCl, so it is legally available online and without a prescription. Did you talk to your doctor about other prescription weight loss drugs before choosing phentermine? What convinced you (or your doctor) to choose your current medication? Share your experiences in the comments section below! Weight loss pill should use as a compliment. It\’s true that it can really work but we need an exercise routine in order to keep our weight! Thanks for sharing! Phentermine was working until I developed hip joint pain. The pain made the prospect of exercise unbearable. Now I need to find an alternative.